Niels Henrik David Bohr was born in Copenhagen, Denmark, on 7 October 1885 into an academically-inclined family. In fact, it was his father, a Physiology professor at the University of Copenhagen, who coaxed Bohr toward a life of science. In 1903 Bohr enrolled to study at Copenhagen University. He majored in physics, a field very much in its infancy in Denmark at the time. Indeed, the university only had one physics professor, Christian Christiansen, He also studied maths and philosophy. 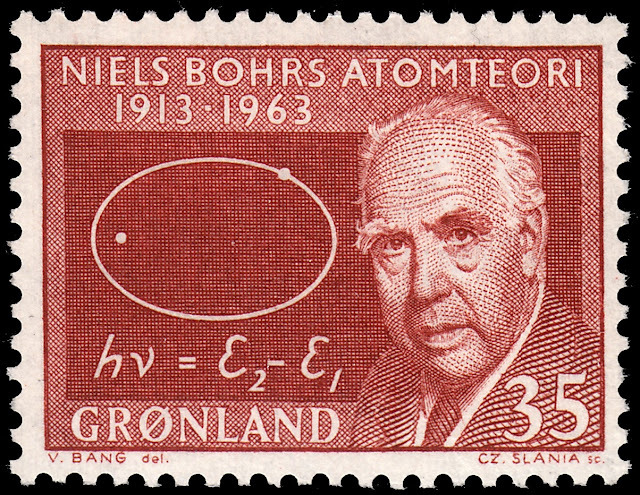 Bohr excelled in his studies and went on to earn a doctorate in physics. After a trip to England and Scotland with his new bride, he returned to take up a position at the University of Copenhagen. Then his career really took off. Bohr's career and his research into Theoretical Physics is extensive and beyond the scope of this blog. So a very brief highlights package should suffice. His first career highlight was in 1913 when he devised the Bohr Model, an early model of a hydrogen atom. In 1920 he founded the Institute of Theoretical Physics at the University of Copenhagen, now known as the Niels Bohr Institute. Then in 1922 when he won the Nobel Prize in Physics. In his research, Bohr predicted the existence of a new zirconium-like element, which was named hafnium, after the Latin name for Copenhagen, where it was discovered. Later, the element bohrium was named after him. During the 1930s, Bohr's humanitarian efforts helped rescue many people from Nazi-occupied Denmark. Then in 1943 Bohr became a direct target of the Nazis after he had a meeting with Heisenberg, the head of the German nuclear weapon project. After hearing that the Germans wanted to capture him, Bohr fled to Sweden, and then to Britain, where he became entangled in the British element of the Manhattan Project. After the war his research focused on the study of nuclear energy for the betterment of humankind as opposed to its obliteration. He became one of the founding members of CERN, the largest particle physics laboratory in the world, located in Geneva, Switzerland. CERN is an acronym for Conseil Européen pour la Recherche Nucléaire (European Organisation for nuclear research). CERN is home to the LHC or Large Hadron Collider, a giant particle accelerator tunnel with a circumference of 27 km. Following on from his involvement with CERN, Bohr went on to be the first chairman of the Nordic Institute for Theoretical Physics in 1957. 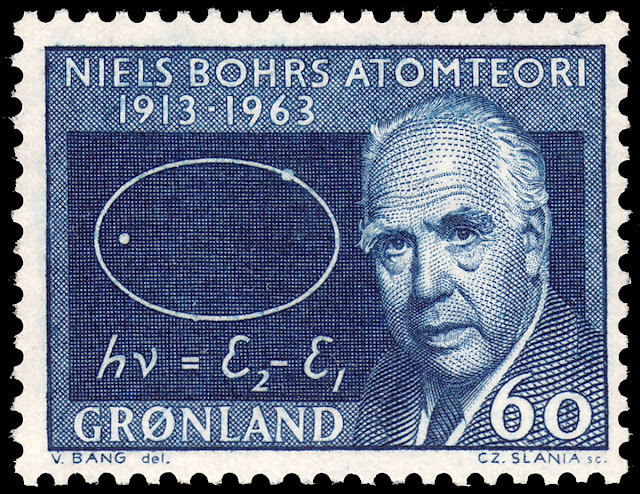 Five years later on 18 November 1962 Niels Henrik David Bohr died at the age of 77 in Copenhagen. On 21 November 1963 Greenland issued a single-design set of two stamps honouring Niels Bohr. The design was engraved by Czeslaw Slania. 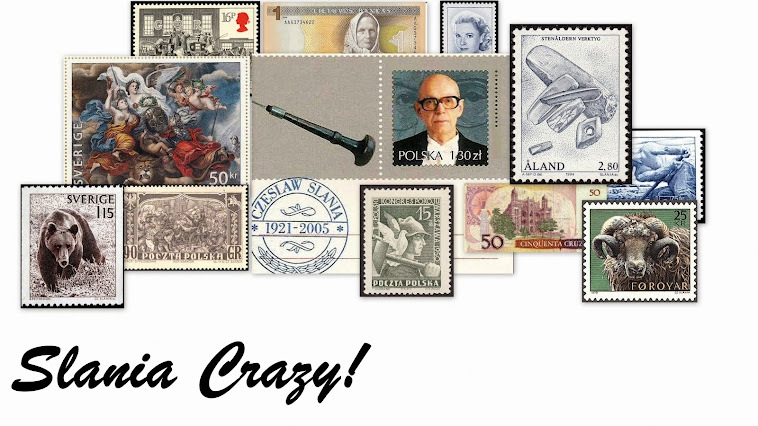 It is worth noting that this set was also issued in Bohr's homeland of Denmark on the same day. This stunning design features a portrait of Bohr next to the equation for the Bohr Model of electron transition.